All Julidochromis cichlids are cave spawners and will deposit eggs that they care for and protect. Julidochromis cichlids form pairs that usually are kept until the individuals are separated by death. If you wish to breed Julidochromis cichlids the best way to go about this is to buy a small group of young Julidochromis cichlids and let them grow up together. As long as you make sure that your group includes males as well as females, the fish will eventually form pairs as they mature. Julidochromis cichlids are generally not very tricky when it comes to forming pairs, as long as they know their mate and have grown up together. 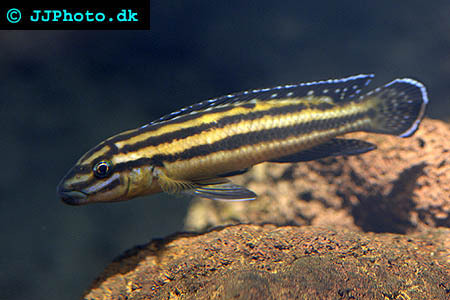 Keep in mind that all Julidochromis species crossbreed, and some of the offspring will even be fertile. When a pair has been formed the fish will start swimming around together and claiming their own territory. Both sexes will defend the territory from intruders. Since they are cave spawners, you must naturally include suitable caves and rocks in the aquarium setup. The territory will be centred on the cave found most suitable by the pair. It is recommended to create several spawning sites for the Julidochromis cichlids to choose between. If you do not wish to build a lot of caves from rocks, you can instead place clay pots with the bottom up in the aquarium. The hole in the bottom of the pot should be large enough for the Julidochromis cichlids to barely swim through. Ideally also create an opening on the side of the pot. Just like many other cave spawning cichlids, Julidochromis cichlids are known to appreciate this type of artificial pot caves. If your aquarium is too small to allow several Julidochromis pairs to claim their own territories, you should remove the other fish as soon as you notice that a pair has been formed. If your refrain from doing this, the fish will engage in territorial fights and the strongest pair may very well kill the others. The Julidochromis pair will clean the roof of their cave very carefully and then attached the eggs to the roof. Both parents guard their offspring, and the male will usually resume responsibility for guarding the territory around the cave while the female guards the eggs. Many aquarists do not even notice that spawning has taken place until the see free swimming fry in the aquarium. The fry will stay with their parents for a long time, and it is not uncommon for different batches of fry to live side by side. Free swimming Julidochromis fry is large enough to eat newly hatched Brine shrimp, but should not be fed until their yolk sacks have been finished off. Keep in mind that the parents will enjoy eating Brine shrimp as well, so you might have to feed the fish quite a lot of Brine shrimp to make sure that the fry get some. It is always a delicate balance between feeding too little or too much. When the fry have reached a certain size they will be chased away by the parents. This usually happens when the fry is around 3 centimetres (1 inch). If your aquarium is large you can let the fry stay, as long as it is possible for the fry to escape to areas far away from the territory of their parents. If the aquarium is not large enough for such a solution, you must remove the fry. If the fry is not removed the fry will be killed now or as young adults.